Sit in comfort anywhere you go with this portable foam seat cushion. 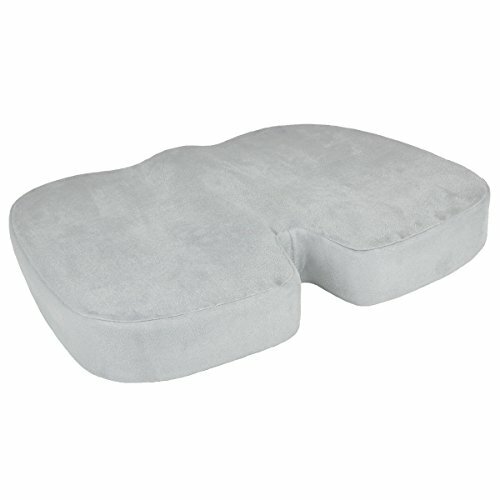 The durable foam padding that makes up this seat cushion is specially designed with curves that take the pressure off your tailbone and hip bones, which promotes healthy posture and spine alignment, prevents pain and numbness when sitting for long periods of time, and helps treat injuries and ailments of the spine or tailbone. This easy-to-transport pad is perfect for adding comfort to chairs of all kinds, including stadium seats, wheelchairs, car seats, and airplane seats. Use the zipper on one side of the gray velour cover to remove the cover for washing when needed. Approximate Dimensions: 16.5" W X 13.5" D X 2.5" H.
Comfortable and ergonomic seat cushion with a removable gray velour cover. Designed to make chairs, wheelchairs, stadium seats, car seats, and airplane seats more comfortable by taking pressure off of the tailbone and hip bones when you sit. Encourages healthy spine alignment and proper posture, and helps treat ailments and injuries of the spine and tailbone. Use the zipper along one edge to remove the velour cover and wash it when needed. Seat Cushion Memory Foam - Soft. Orthopedically Designed for Sciatica - Coccyx - Tailbone - Lower Back Pain Relief. Ideal for Home - Office Chair - Wheelchair - Car. Non-Slip Bottom. Carrying Bag.